Integrated Pest Management, or IPM, is an environmentally sound approach to managing pests such as insects, weeds, plant pathogens, and wildlife on farms and forests, in our communities and in our homes. IPM relies on proper pest identification, monitoring, and combinations of pest avoidance and management strategies to protect people, crops, and the environment while minimizing pesticide use. Get Started with IPM (PDF). IPM Compared to Organic Pest Management (PDF). The Maine Legislature established the Integrated Pest Management Council to promote, expand and enhance integrated pest management adoption in all sectors of pesticide use and pest management within the State. Our mini-poster describes what we do. 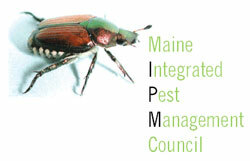 The Maine IPM Council is administered and coordinated jointly by the Maine Department of Agriculture, Conservation and Forestry and the University of Maine Cooperative Extension. The Council is made up of 11 members representing a broad base of IPM stakeholders. The Integrated Pest Management Council will define, promote and enhance implementation of IPM practices that reduce or minimize harmful environmental and human health impacts of pesticides and other pest management practices. The Council will promote the education of the public regarding the need, benefit, and practices of IPM. Cooperate with appropriate organizations to establish protocols for measuring and documenting integrated pest management adoption in the State. Action: The Council has partnered with the New England IPM Information Network and its parent organization, the Northeast IPM Center to share information used in the development of 'strategic plans' and 'resource profiles' that include IPM practices and standards. Development of these products is on-going and are designed to provide a road map for advancing IPM in all sectors of pesticide use. Action: The Council developed a table display and a brochure aimed at public education about IPM which is available for use at garden shows, shopping malls, educational events and other public venues. Action: Council members work to raise awareness among their constituents and promote active partnership with other organizations through formal and informal presentations at meetings, conferences and other venues to promote greater adoption of IPM in Maine. Action: Participate in Environmental Stewardship Program. Update Partnership Strategic Plan annually. In Maine, you can contact your county Cooperative Extension office or the Extension Pest Management Office for pest identification and management recommendations. They can also direct you to other reliable resources. Outside of Maine, check the phone book for the Cooperative Extension office nearest you. Or, check Got Pests? for good pest identification and management tips.